With TT fortnight at an end, you may already be planning to go back again for more of the same in 2015. While on the island they were already advertising on Manx Radio and billboards to plan your next trip via local travel agents. Even before this years TT began the Steam Packet reservations office had already seen a 41% increase in ticket sales on first day sales when they opened their books for the 2015 campaign. 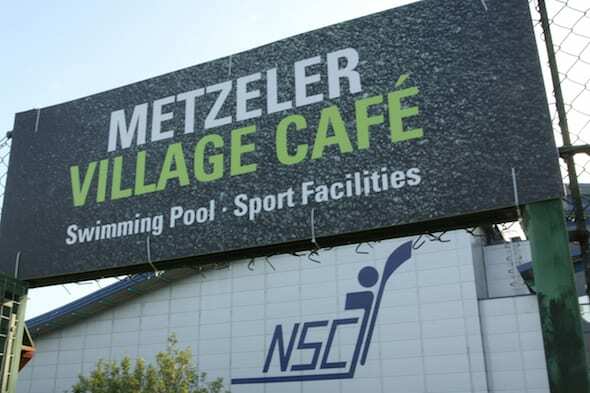 So planning ahead is a must, and when looking at accommodation it is worth keeping your eye on Metzeler for their camping village. Now I am no fan of camping – all that far-la-deee far-la-daaa my ruck sack on my back stuff – well you can poke that. But what Metzeler offer is something quite different. It’s a kind of Glamping without unnecessary glam. 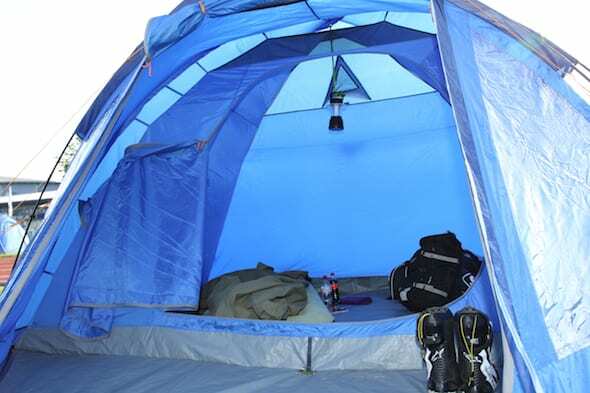 All of the tents are pre-pitched so you don’t need to take one. 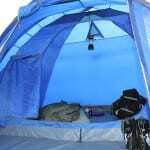 They also provide an air mattress and night light – three camping essentials that take up a lot of room on you bike or luggage. The reservations are taken in a hotel style so if you did get noisy neighbours, which I hasten to add over my three night stay I didn’t, they know who they are and can do something about it unlike regular sites. The Metzeler goody bag you get on arrival is pretty good, too. 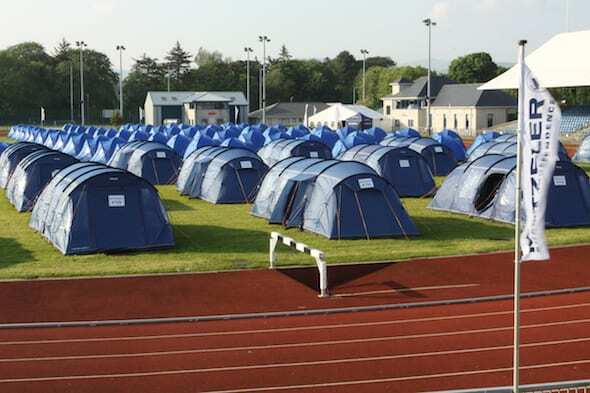 The Village is located in the Isle of Man’s National Sports Centre with the tents pitched in the middle of the running track, so the facilities are excellent. 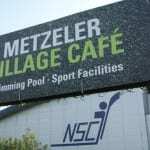 You can get breakfast in the café or even use the facilities of the pool, which is just across the track. 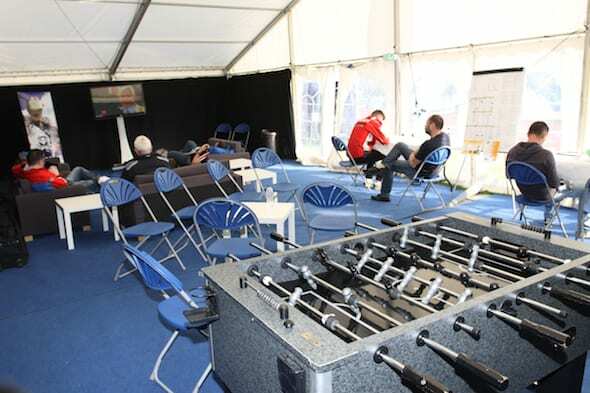 The onsite facilities (showers, toilets etc) are pristine and team Metzeler add their own ‘Chill out’ area of table football, sofas, TV and my personal favourite – hammocks. Security guards are present all night and no one gets in the locked entrance without being buzzed in via a wristband. The bike parking is gated off with the entrance right outside the security office. It’s all very well thought out, comfortable and at this years price of £15 per night per person, or £12 if you arrive on Metzeler tyres, it’s a much cheaper alternative than a hotel. The campsite backs onto the Quarterbridge pub which is trackside so you don’t have too go far to have a pint and watch the action, or indeed head straight up to the Grandstand via Bray Hill when the roads are open. This is an adult site: you must be over 16 to stay which is limiting if on a family visit to the TT but if it’s an adult only trip, it’s a good option and worth keeping an eye on www.Metzeler.com when tickets go on sale, expected to be around September.